The 13th IDCC took place in Barcelona in February this year and with the help of a scholarship from the DPC, I was able to attend for the first time. The conference theme was ‘Beyond FAIR’ (findable, accessible, interoperable and reusable) data, and these principles were at the heart of many of the talks. Questions surfaced about the extent to which it is possible to make data FAIR, the challenges involved and what needs to be considered outside these principles. As a new professional, it was interesting to hear about data curation in a range of contexts from those actively engaged in digital practice. The focus on sharing practical lessons meant being able to see examples from across the data curation community of the principles of FAIR data being applied. The enthusiasm of the speakers to talk about the work they are involved in, the developments they’ve made as well as the setbacks they’ve experienced in the pursuit of making data FAIR was not only useful but inspiring. The link between data curation and Open Science implementation was the focus of the keynote given by Professor Sabina Leonelli from the University of Exeter. Her research on ‘data journeys’, for example tracking the reuse of clinical assessment data for research purposes, demonstrated the benefits of making research data FAIR. However, she also highlighted how the complexity around making data FAIR presents challenges to the implementation of Open Science. Low awareness of Open Science tools among researchers and confusion around what openness means were also factors. Leonelli pointed to the key role of data curators and argued that effective, context-specific data curation is crucial to big/open data re-use. Encouraging engagement with Open Science is a priority for LSE Library, so it was interesting to learn more about the challenges around implementation. Understanding these challenges, such as low awareness of Open Science tools, could help to identify ways to increase engagement and support the library’s aims. The users, or re-users, of data were the focus of the talk given by Carolyn Hank from the University of Tennessee who discussed her work to explore how re-users discover and evaluate data. Research data re-users were interviewed with the aim of using the findings to inform a framework of fitness for use of data/metadata from a re-user’s perspective. As well as contributing new user-centred knowledge on the access and use of data, the research points towards developing data principles beyond FAIR to better meet the needs of data re-users. Hearing about this approach helped me to consider how I could apply the principles of FAIR data to my own work with metadata. User experience is central to the design of metadata for the LSE’s digital collections and applying FAIR data principles to support this process offers a way to help to enhance the user experience further. Data re-use and the concept of FAIR data from a technical perspective was discussed by Dennis Wehrle and Klaus Rechert from the University of Freiburg. Their paper addressed challenges around long-term preservation and the fast technical life-cycle which impacts the format of data. The focus was the significance of file formats and the need to go beyond the principles of FAIR as making data findable and accessible may not necessarily allow for re-use in the long-run. The conclusion was that the principles of FAIR, while abstract, help to foster conditions for long-term preservation but that action with regard to file formats was essential to ensuring FAIRness for future re-use of data. It was interesting to hear about these challenges around file format and preservation as they come up in my own work with digital collections. Thinking about how the principles of FAIR data could be applied to these issues was useful as this could help to measure the extent to which we can ensure the FAIRness of data in the long-run and inform decisions about preservation. As well as exposure to new ideas and developments in digital curation, getting to meet many of the other delegates from organisations all over the world was one of the most enjoyable things about attending IDCC18. There was a strong sense of community, shared purpose and excitement about sharing knowledge and experiences. Having the opportunity to talk with people working in a diverse range of areas who were keen to share their experiences and ideas was very encouraging and it was exciting to feel part of a community that puts such emphasis on collaboration. 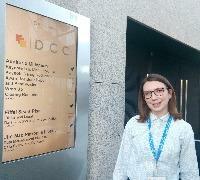 Clare attended IDCC 2018 with support from the DPC's Leadership Programme which is generously funded by our Commericial Supporters Arkivum, MirrorWeb and Preservica.